The Chinese government seized over 1 lakh wireless sets which were meant to facilitate cheating in China’s most competitive entrance test. The Gaokao is the academic qualification test for almost all high school graduates in China who want to receive an undergraduate education. Nearly 9.8 million Chinese students will sit for the exams Today onwards. A statement issued by the ministry of public security said that it had undertaken a crackdown on criminal gangs that manufacture and sell high-tech devices for cheating in the upcoming exams. “The campaign, launched in Liaoning, Shandong, Hubei, Guangdong and Sichuan provinces and the Inner Mongolia autonomous region in late May, resulted in the busting of 12 criminal gangs and the seizure of over one lakh sets of wireless devices for cheating,” the ministry said in a statement. China on Wednesday lashed out at Washington's unexpected statement that it will press ahead with tariffs and restrictions on investments by Chinese companies, saying Beijing was ready to fight back if Washington was looking to ignite a trade war. The police also arrested more than 50 criminal suspects from 12 criminal gangs. The total value of equipment meant for cheating ran into several hundred million yuan. 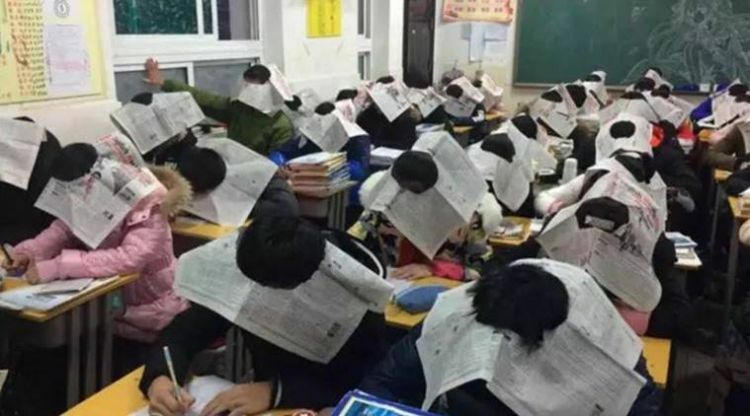 China has listed cheating in the exam as a criminal act in its amended Criminal Law, which came into effect on Nov 1, 2015. In many provinces the state administration has also started using facial recognition technology to register students sitting the gaokao, or national college entrance examination. The Facial recognition is not only used to speed up registration, but also deter students from hiring others to sit the exam in their place. Local officials also deploy drones, metal detectors and other technology to deter cheating. Gaokao is the academic qualification test for almost all high school graduates in China hoping to receive an undergraduate education. It was first started in 1952 but was halted. The first such standardised examination in the People’s Republic of China was held in 1952 but halted in 1966 during the Cultural Revolution chairman Mao Zedong decreed that educated youth must be “sent down” to the countryside to “learn from the peasants”. It was subsequently restarted in 1977. Students have to give exams in three compulsory subjects – Chinese, mathematics and English – and one comprehensive subject depending whether the candidate chooses to major in liberal arts or the sciences.The exam is spread over two days and lasts a total of nine hours. Thier scores determine which university they can go to and also what careers they can choose. A total of 9.8 million students will be taking the Gaokao test this year which is 350,000 more than last year. For the test which is deemed to be the most significant tests in a young person’s students would often start preparing years in advance and revising for 16 hours a day without a break in extreme cases.